Each week, as regular readers know, we pose a series of questions to a winemaker. This week, we’re featuring Eben Sadie of The Sadie Family based in the Swartland of South Africa. Eben has traveled around the world, working in vineyards in Germany, Austria, Italy, Burgundy, and Oregon before returning to South Africa in 1998 to work at the Spice Route. In 1999, he started his own independent production under the Sadie Family label. If you’ve ever met or even read about Eben, you know he’s a character. He’s fun-loving and seems to have a slightly mischievous and rebellious side. As you chat with him, he’ll probably bring up his love of surfing and he’ll likely drop a few casual f-bombs in conversation. He’s also intensely ambitious, competent, and focused with a visionary plan for the wines he makes in the Swartland. He truly believes in old vines, in farming, and in respecting the earth. During my visit, I had a chance to try his Skerpioen, Columella, and Palladius. All of them were really freaking good. The Palladius was the only bottle I bought in South Africa and brought back with me. At $50 and up, his wines retail at a price that’s higher than many of his peers in South Africa, which he attributes to the lower yielding old vines. They can also be tough to find in the U.S., which reportedly only sees 5-10% of Sadie Family’s ~3,500 case production. Check out our interview with Eben below the fold. And if you’re interested, you can also hear him talk about the importance of old vines from a recording I took on my walk with him around the vineyards in South Africa last month. What is your general winemaking philosophy? Nothing should ever be added. No ego, nor any other element. All you need is the fruit you pick, and this fruit should be from sound, healthy and natural vineyards. The perfect grape is enough for wine. What’s open in your kitchen right now? I always have many bottles of wine open. I hardly ever only drink just one bottle at a time. At the moment? Let me get up and go see! OK, there is: Gravner Ribolla 2005, Foillard Morgon 2010 in Magnum J, Francois Raveneau Montee de Tonnerre 2005, 2006 Gramenon La Mémé and a bottle of 2012 Secateurs Blanc from my neighbor A.A. Badenhorst. It is spring here, so mostly whites and elegant reds for now! Who are your favorite winemakers in history, through personal account, or their wines? First, Jacques Reynaud from Chateau Rayas in the Rhone because of the elegance in his wines. Another favorite is Henri Jayer & Frédéric Mugnier for the purity and perfection in their wines. Next, Gerard & Lionel Gauby, a father and son pair who make really “emotional” wines. And finally Vega Sicilia & Viña Tondonia whose wines have remained unchanged in history. What new winemakers are you most excited about, and why? In the USA, I am excited about Duncan Arnot Meyers and Nathan Lee Robert from Arnot Roberts because of their notion of terroir. 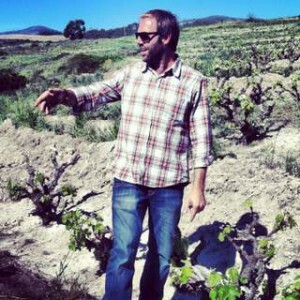 In Spain, Raul Perez because of his personality and his obsession with terroir. Last, Jean-Marie Fourrier in France who makes wines that are loved for their purity and terroir. What’s the best wine you’ve ever tasted? The most interesting? This is a question I’m often asked and I think the question in itself is void. This question surely can only be asked to someone that started drinking wine a week ago! In 20+ years, it can never come down to a wine for me. What’s the oldest bottle in your cellar? The most expensive? The oldest is a 1947 Domaine Huet Vouvray Le Haut-Lieu. I’m not sure of the most expensive…I never remember the price of wines. If you had to pick one red and one white to drink for the next month with every dinner, what would you choose? For white, it would have to be a Riesling from the Mosel Spatlese Trocken. For the red, it would have to be from Burgundy and I will say a premier cru from the Côte de Nuits. What’s your biggest challenge as a winemaker? To not travel and to refrain from any appointments in order to have the time it takes to be in my vineyards and attend to them properly. So in essence, avoiding people! What’s your favorite wine region in the world — other than your own? Is beer ever better than wine? I live life on my sleeve…so people have pretty much they have seen everything. I don’t believe in keeping secrets. If you weren’t making wine for a living, what would you be doing? I would hippy around the globe in search of the most perfect waves day in and day out! Eben, I’m a lifelong bodyboarder and a total nut about it, and I love surfing big, cold waves. I’m heading to South Africa in April, and, in addition to drinking wine, I’m also hoping to “surf solid waves.” We should hit the water together, bro!